Are You Alert DC Overloaded? Back when I signed up for Alert DC, I found it a great way to know of bad events in DC. From major road closures to water and electrical outages, Alert DC was first to alert. Now it seems its the first to annoy. 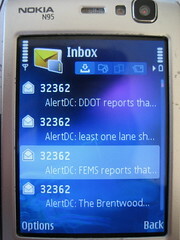 Alert DC went from a few important messages a week, each one sent as a concise text message, to the Twitter for all of DC government, with multiple random text alerts per day, many going over the 128 character limit. So thanks for over communicating DC, but stop doing it with what should be a high-priority only, short text only service. If you wanna do more, use Twitter, like WeLoveDC does.